Gerald Robert Gentry, 92, of Casper, passed away Monday, March 18, 2019. He was born to the late Ernest and Eron Gentry on March 25, 1926 in Ardmore, Oklahoma. He graduated from high school in Fox, Oklahoma. 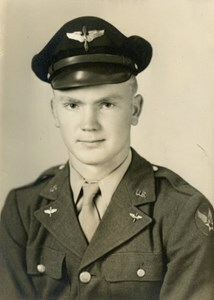 Following graduation, Gerald entered the Army Air Corps and served in Germany during World War II. Returning from the war, he worked as a chemist in a Refinery before the oilfield in Oklahoma. He was a resident of Casper since 1962 with a long career in oilfield sales. He retired from Halliburton. Gerald was an active member of the First United Methodist Church of Casper, the Shriners and the Elks Club. Gerald was also a passionate golfer. Following retirement, he and Connie enjoyed overseas travel as well as trips down south near the Gulf. Gerald is survived by his wife, Connie Gentry, son Jerry Gentry (Jo Gentry) of Arvada, grandchildren Stacey Maddox (Scott Maddox) of San Antonio, TX, and Jason Gentry (Dawnee Gentry) of Arvada, and three great grandchildren, Karis, Sy-Dane and Gage Gentry. In lieu of flowers, the family would like memorials to be made to First United Methodist Church or The Casper Shrine Club. A Memorial Service with military honors will be held Friday, April 5, 2019 at 2:00pm at Oregon Trail State Veterans Cemetery in Evansville, Wyoming. Please click the "Share Memories" button above to share a message with the family. Add your memories to the guest book of Gerald Gentry.